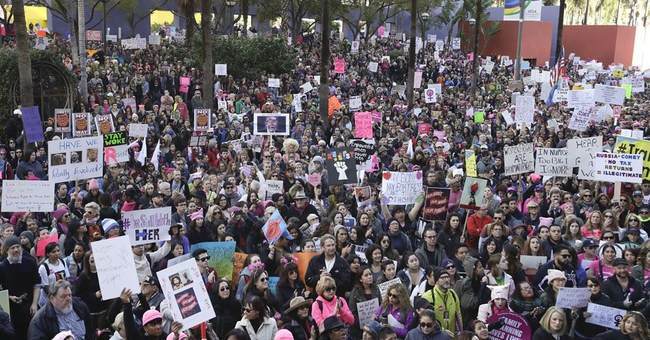 Whether they were paid, George Soros induced, or just that their heart was overpowering their brain, it was impressive the number of women and men who gathered in Washington D.C. from around the country for the Women’s March on Washington. These slogans were clear. They were echoed by millions of protestors across the land. The message could be easily understood, whether you agreed or not. I watched, listened, and waited carefully for the message to be delivered by the women of the March on Washington. I am still waiting. I heard famous movie and rock stars commiserate with the attendees about their oppressive female victimization at the job place as they cash their multimillion dollar paychecks. I saw signs demanding equality and was concerned that those lady sign holders weren’t allowed to vote in the last election. Perhaps they weren’t allowed to ride on public transportation with men. Maybe they are being denied seating in restaurants, not allowed to hold a mortgage, or maybe even being prevented from attending the college of their choice. I am not familiar with that part of the country that is apparently denying those women that equality. I heard the repetitive cry about not taking away their right to “choose.” I was not aware that Roe v. Wade had been repealed. I would have been much more taken and impressed had they focused on one theme. Maybe I would have felt the 60s juices flowing had they protested the historic eight years of continuous war and the thousands of innocent dead women and children. Maybe I could have gotten excited about them chanting that a woman and child had been promised that they could keep their doctor. My ears would have perked up had they protested no jobs, staggering debt or worthless college degrees. Unfortunately all of the above is a very specific protest and would have required a March on Washington well before Donald Trump was sworn into office. It would have meant being concerned and ACTIVE while Barack Obama was still in office. Come to think of it there was a protest held. It was called the general election. The March on Washington was simply a Kumbaya moment among hundreds of thousands of Hillary supporters who could not accept the fact that she had lost. As a child of the 60s I would say these women have a lot to learn about the art of protesting. The first thing is to actually decide what it is you are protesting and then make it clear to your listening audience.